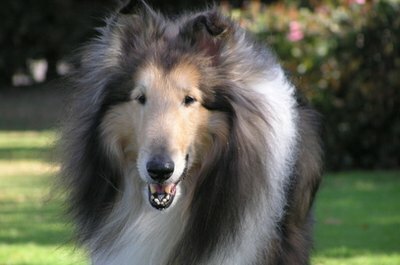 Many breeds with long coats, such as this collie, can benefit from line brushing. Line brushing is a relatively simple method of grooming that leaves a dog’s coat looking and feeling soft and full. While it is a time-consuming process that requires a well-trained and compliant dog, consistently line-brushed dogs’ coats remain healthy and free of debris, knots and mats. Secure your dog to the grooming table using the grooming noose or harness. If you don't have a grooming table, a card table topped with rubberized shelf liner makes a suitable alternative. If you use a leash or a grooming arm to secure your dog, make certain there is enough slack to allow the dog to lie comfortably on his side. Have your dog lie down on either side of his body. Begin grooming at the lowest point on your dog that has a long full coat. If you have an Old English sheepdog, poodle or any dog with a lot of hair on his legs, start grooming just above your dog’s feet. 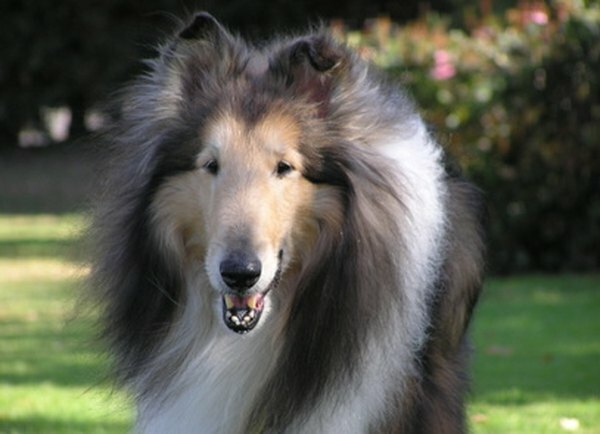 If you have a collie or any dog with fringes on the legs instead of a full coat of hair, start grooming along the lower rib cage or on the shoulder right above the front leg. Mist your dog’s hair until it is damp to the touch. If he is a large dog, you may have to mist him in sections to ensure that you are always brushing or combing moist hair. Brush the entire coat in the direction of the hair growth, using the soft bristle brush. This step of the process is intended to separate any hairs that have stuck together. Brush the hair against the grain of the coat growth, using the bristle brush again. Brush the entire body this way if you have a small dog, or if you have a large dog, you may choose to work in sections. Change over to the pin brush. Separate a line of hair to brush forward, once again brushing with the grain of the hair growth. Use a gentle touch when brushing with the pin brush; you should not be able to hear the pins moving through the coat. Groom vertically up the leg or body, separating narrow sections of hair and brushing them forward in a line as you go. CoCo Cabana Havanese suggests that when grooming small dogs, such as Havanese, you should work in lines of coat less than an inch in width. If your dog has leg furnishings, then work on the inside of the leg that is against the table before asking your dog to turn on his other side. Use the same technique to groom your dog's chest, belly and tail, after you have completed brushing his legs and sides. Remember to spray the hair you will be grooming before brushing it before moving on to each part. Allow your dog to stand. Comb his hair with the grain of the coat growth, to be certain that all tangles have been removed from the coat. Once you've completed this step your dog’s coat should stand out from his body and each hair should be separate from all of the others. Finish grooming your dog, using the soft bristle brush on the short hairs of his face, ears and paws. If your dog has long furnishings on his ears, you may wish to line brush them, as well. You can fill the spray bottle with water only. However, adding a tablespoon or so of conditioner reduces static and helps release tangles and mats. Work as quickly as possible while maintaining a relaxed pace. Grooming should be an enjoyable experience for both you and your dog. Apply baby powder to mats or knots to release them. Try to break up mats using your slicker brush before using a dematting tool. Place your hand between the bottom of the mat and your dog’s skin. Lightly powder the mat, then press the bristles of the slicker brush into it. Move the slicker brush in such a way that the matted hairs are separated then gently brush them out. Repeat this process until all hairs have been released from the mat. Never groom a dry coat. Brushing or combing a dry coat can create static, which leads to hair breakage. Do Cockatiels Need a Play Gym?